This article explains how to create your first Objective in Gtmhub. From the drop-down menu choose the session. Ones you’re there, click the Add new objective button on the upper right corner. A form for creating a new Objective will appear. Name (required) - title of the objective. For example, Improve communication between sales and marketing team. Description (optional) – describe why you want to achieve this objective. For example, Our conversion rate is pretty low so we need to improve the way in which marketing and sales teams define qualified opportunities. Owner (required) - person or a team that is responsible for the objective. To set the owner, just start typing the name of the person or a team and selector will appear. Select the person or a team from the selector. Alignment (optional) - If this objective exists in order to support a higher-level objective, you can establish the relations between the two objectives here. For example, if you have decided to Improve communication between sales and marketing team in order to support Increase conversion rates objective, you would align your objective with Increase conversion rates objective. Privacy (optional) – mark your Objective as private in case there is a sensitive information that should be available to you, your manager, and account administrator. 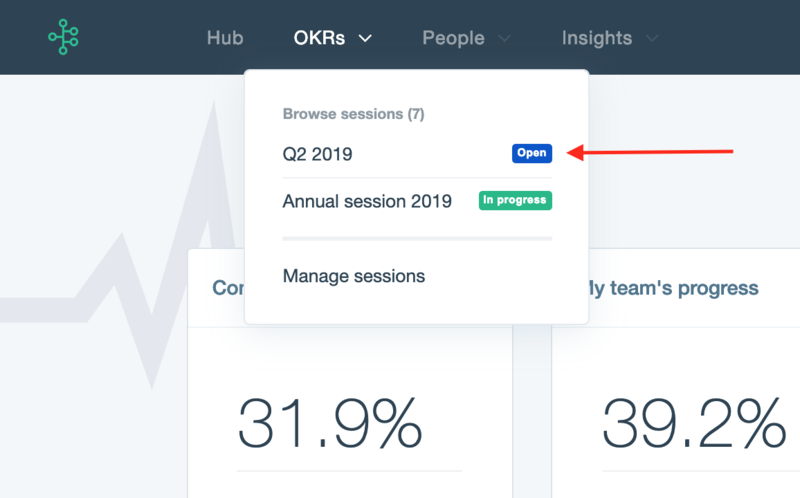 Click on the Save objective button and your OKR will be created. You can now proceed to defining key results for this objective.